What a cute little 6cfm air compressor! - One person's lack of compassion does not equal another's comfort. What a cute little 6cfm air compressor! I just ordered a refurbished oilless air compressor to replace my non-oilless one. This is a refurbished air compressor priced at $225 after shipping originally sold new for a lot more. The price of the same air compressor at Lowes is $299 (plus 5% MD sales tax to a total cost of $315) and I'm not entirely clear if the one they are selling is new or refurbished at that price. The online Lowes ad doesn't specify either way suggesting it is new, but I have seen other companies selling this exact unit playing down the refurbished aspect. This very same air compressor is selling at Harbor Freight as a refurbished unit for $250 plus pricier shipping, but this company is offering it for $219 with flat rate $6 shipping to a total of $225. If you want to see one up close I recommend visiting a Lowes hardware store. The real reason I began shopping for one recently is that I figured out why my nail gun was not working consistently. Apparently while my nail gun is rated for a maximum working pressure of 90psi, it won't drive 4" nails all the way in when using pressures of less than 90psi, which meant that to build all my shelving, half the time I had to manually drive such nails the rest of the way in using a conventional hammer. This compressor actually cuts in at 90psi as opposed to 80psi which my old one does and has a 150psi max pressure which the manufacturer promotes as a way to get that much more reserve air out of its tiny tank. One thing it doesn't claim unlike some other manufacturers is that it is quiet, but then neither was my old one. I liked this one from the moment I saw it. I could actually describe it as "cute". One of its selling points is the "roll cage" design. 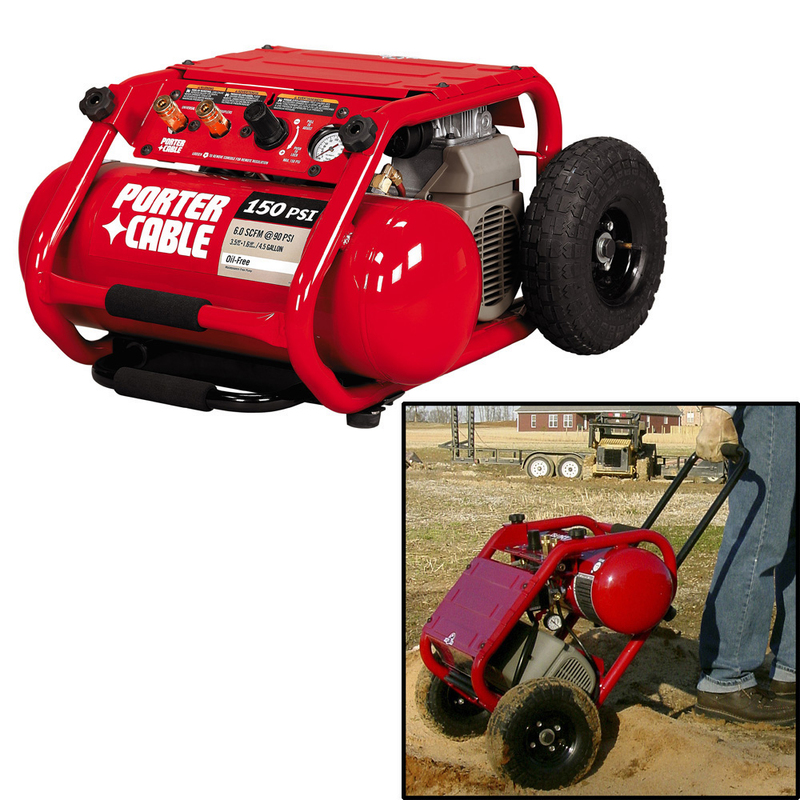 Unlike many other air compressors, if this one tips over it is much less likely to hurt itself. Although the manufacturer mentions that its handle retracts for more compact storage, they fail to mention that it's pneumatic tires are also easily removable allowing it to be stored vertically. It is possible that it can be operated in this position as well considering it does not use oil for lubrication. One of its more unusual features is a removable remote "control panel" which consists of its pressure gage, regulator and dual output air ports. The panel is connected to the pump via a short hose which disconnects using the same style of quick disconnect allowing the user to place the regulator and ports a distance from the compressor. Unlike at least one I've examined, it has an intake air filter, where as I previously thought they all did. The brand I noticed which lacked the air filter was a compressor I saw at Home Depot made by "Ridgid", model OF45150 priced at $260. Specs: 6.2cfm@90psi, 3hp, 150max psi, which are pretty much the same specs as this porter cable.